In Phase I, local government, state and federal agencies have organized teams of experts from the California State Department of Toxic Substances Control (DTSC) and U.S. Environmental Protection Agency (US EPA) to inspect your property and remove any hazardous waste that may pose a threat to human health, animals, and the environment such as batteries, herbicide, pesticide, propane tanks, asbestos siding, and paints, and e-waste. Phase I is automatic and includes both residential and commercial properties destroyed by the fire. Download a list of items that are eligible and not eligible in the Government-sponsored Debris Removal Program. Download a list of Frequently Asked Questions about the Government-sponsored Debris Removal Program. If you are selling a property or have sold a property with structural debris present you can download an affidavit of Property Transfer for Government-sponsored Debris Removal Program. View the Phase II status map by clicking here. Property owners who do not qualify for, or who chose not to participate in, the Government-sponsored Debris Removal Program, must hire properly licensed private contractors and consultants to remove fire debris and clean up their properties. 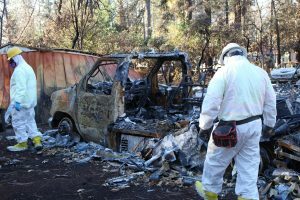 An Alternative Fire Debris Removal Application form must be submitted, and a Work Plan must be approved by the Butte County Environmental Health Division prior to the commencement of work. Private debris removal is done at the homeowner’s expense and must meet the standards outlined for the Alternative Program. This includes compliance with all legal requirements for disposal, best management practices for activities on site, proper transportation and documentation of waste, and erosion control. Download the Alternative Program Guidelines. Download the Alternative Program Application. Download Appendix E as a fillable PDF. Download Appendix F as a fillable PDF. Download Frequently Asked Questions about the Alternative Program. Check the status of your Work Plan by clicking here. The Neal Road Recycling and Waste Facility (NRRWF) accepts fire debris and ash from contractors in the Camp Fire Alternative Fire Debris Removal Program. Haulers must present a certificate to dispose of fire debris and ash at the NRRWF. Butte County Environmental Health issues certificates directly to contractors. If a property owner has a policy that permits debris removal as part of the total coverage amount but does not have a specified amount, how much am I liable for? The county will collect whatever remains available for debris removal, if anything, after a rebuild is complete, or after the property owner has elected to take a cash out amount and/or purchase a home elsewhere. If a property owner does not rebuild or purchase a property/home elsewhere, will the county still collect a portion of the insurance policy for debris removal? The answer to this question depends on your individual insurance policy. There are generally two types of homeowners’ insurance policies. In rare circumstances, an insurance policy will pay the actual cash value of the home and there may be no coverage for debris removal. In that case, the county will not collect anything. This stands whether or not the property owner rebuild, purchase a home elsewhere, or exercises neither option. Under an insurance policy that requires payment of replacement cost for the loss of the home, there will be debris removal coverage and the County will collect against that coverage. There may be other types of insurance policies that differ from the above two. Property owners with those policies should clarify debris removal coverage with their insurance companies. How do I know when the fire debris removal is complete on my property? You will receive a letter in the mail at the address provided on the Right-of-Entry form informing you the property cleanup is complete. The Town of Paradise or Butte County Building Departments will be notified that the property cleanup has been completed and that permits may be issued. Visit the Phase II Map located at www.buttecountyrecovers.org/maps and navigate to your property. Visit the County’s online permit center at https://dspermits.buttecounty.net/Search/case.aspx and search choosing your Parcel Number or Address. The status, Property Clean-up Completed indicates the property is clean and ready for building. You will receive a letter by e-mail at the address provided in Appendix F of the Alternative Work Plan for your property. The letter will be mailed to you at the address provided if no email is provided. The letter will be sent after Appendix F and the confirmation soil sampling report are reviewed and approved. You may also check the status of your property cleanup online by visiting the County’s online permit center at, https://dspermits.buttecounty.net/Search/case.aspx and search choosing your Parcel Number or Address. The status, Property Clean-up Completed indicates the property is clean and ready for building.